It takes quite some will to supress oneâ€™s appetite to indulge in a rich Indian sweet, be it a melt-in-the-mouth gulab jamun or bread halwa. But who can resist them? 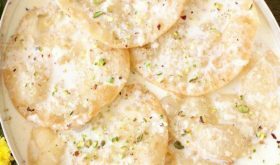 Over the past week we have been indulging ourselves with a lot of desserts – badam kheer, biscuit cake and bread halwa to name a few of the sinful temptations as we entertained friends at home. Bite sized pieces of bread are fried in a generous amount of ghee till golden brown and then cooked in a milk, sugar and a paste of almonds and cashewnuts till soft and topped with almonds and cashews. The halwa has a rich sweet taste and can be served either warm or cold. I prefer my halwa warm as the halwa tends to be soft and has a nice mouth feel, while the cold halwa is not-so-soft as it tends to harden a bit. But the taste is heavenly either way. 1 Tear the bread into bit sized pieces. Heat three fourth cup of ghee in a cooking vessel and add the bread pieces and fry them till they turn a golden brown. 2 Grind elachi, almonds and cashewnuts (leave a few toasted almonds and cashewnuts aside for garnish) to a fine paste. 3 Meanwhile boil the milk, add sugar and keep stirring it till it blends into the milk. Add the fried bread pieces and the remaining ghee to this mixture. 4 Let it simmer till the bread pieces turn soft and cook in the milk mixture. Combine the nuts paste. Garnish with the toasted almonds and cashewnuts. 4 Serve warm or refrigerate until chilled and serve. It tastes good both warm and cold. Sugar, carbs and Gee…how can this not be a great treat?? That looks yummy.. Can I have some?? 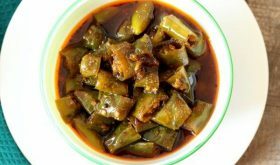 It is very similar to Double ka meeta, but way more simpler. Thanks for sharing. Hi Sailu, This dish looks very delicious and easy to make. Bread halwa is new to me..looks great. thanks for the recipe. Sailu, this is simply delicious. I will definitely try this one.BTW how did you make the photo strip in your side bar. The bread halwa looks simply delicious. Can we replace white bread with whole wheat or oat bread? Sure you can Mandira, replace with whole wheat bread. Your Bread Halwa looks fantastic!!!! 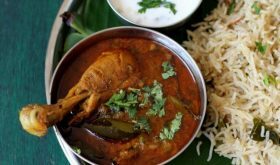 Thanks for sharing an authentic Hyderabad dish.!!!! Do u have recipe for Sujji halwa? If yes, Pls let me know. Thanks! Thanks for the recipe, worth the wait!! This halwa looks good and will definately taste good and the best thing is that we call cook it faster thanks alot for this wonderful receipe. I really love your write-ups and presentation. Your Dosaavakaaya pics are mouth-watering. And the music tops everything. nice recipe mouthwatering, well presented , beautiful snaps. Chala manchi recipe andi.Thanks for sharing. Came by for a visit but thought I had already left a comment here… perhaps I dreamed it? 🙂 This is so decadent I may have to save for Thanksgiving — my one big family meal served here in a year. I think it is the perfect way to introduce my folks to Indian cuisine. BTW never heard this soundtrack you have Sailu — usually have speakers off — I am a bird lover so really enjoyed. Enti mayam aypoyaru…chaala rojulu ayyindi meeru post chesi. Hope all is fine at your end. Waiting to hear from you soon. Hey Sailu, thanks for the welcome! Not seen a post from you for long…are you away? or did i miss something? I usually prepare double-ka-meeta with bread. My recipe is somewhat similar to urs. I ll try ur version soon …thankyou for sharing!! where are you sailu? hope all is well with you and family. It has been a while talking to you. We are now back. Happy Diwali! Here is my personal invitation to you to participate at VCC Q3 2006. The deadline has been now extended. See you at the show! Just wanted to wish you a joyous Deepavali and also, tell you that I’m horribly missing your posts! Hope all is well and you put up another one of your amazing recipes soon! Happy Diwali! You must have had a great Diwali, no need to ask! first of all i want to thank you for ur lovely great receipes. naku peddaga emi varieties cheyyatam radu. US vacchaka konni try chesanu kani baga raledu . edo receipe kosam search cheste me website chusanu. Some site you have here Sailu! It is so nicely designed and you can get at any recipe under the sun in no time at all! Your site is great. For a long time you are not contributing to your site. Start again. Thanks!! Hi.this halwa seems very tasty. this halwa is good and tasty. we can do this with out making them into pieces also. WoW! I will try it today. Hai Sailu,thanks for giving suggestions to make halwa. Can the bread be toasted or baked then put some butter on top. Thanks. Your photos are all stolen from the following site. I made this. I toasted the bread and applied butter instead of frying, still it came good. My son loved it too. Thanks for the easy receipe. Yummy! That looks well nice! I’ll have to give it a go! It looks like the recipe can be scaled down easily too! Hi Sailu, This dish looks very delicious and easy to make.thanks a lot…. HI! Nice recipe! But one question: What’s a loaf of bread? Is that one whole roti? simply delicious!!!!!! !da first sweet i evr did in my lyf. (i m 16! ).tastes divine. Really a great recipe, I will surely give it a try some time. 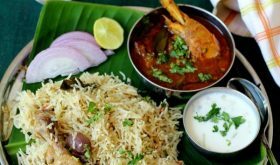 I also found some interesting recipes at hungryzone.com , may be you all can visit it. Thank you very much for your great recipes sailu. Bread halwa is Simply Superbbb!!! My sons appreciate me a lot Sailu. On behalf of you i accept those credits. Once again i thank You…. nice recipe.u inspire me to cook by your photos & simple methods. keep up the good work. Sailaja… Could you please help me out on this recipe? I want to make bread halwa. What is the method used here? is it a deep fry method (deep frying pieces in loads of oil), like frying applams? or roasting the bread pieces with fews tsps of oil on a tava kind ?? if it is roasting the bread pieces then whatever amount of oil poured will be immediately absorbed by the bread pieces right? Please… please… help me out… I want to make this for my party. FrequentVisitor, as mentioned above, deep fry the bread pieces in 3/4 cup to 1 cup of ghee. 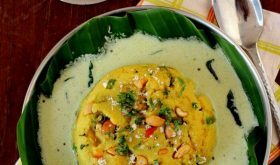 Hey, I’d never heard of this–we make a spicy bread upma, but this looks like a really quick and yummy treat. Will try soon! Ur website is my all time favourite. I luv the way u present it and the pics too. Looking forward for more recipes from you. By the way ur Bread Halwa looks delicious. I have a doubt. One cup means how much quantity? Can u pls clear my doubt? Aarthi, thanks for your kind words. 1 cup is equal to approx 240 ml of liquid. Indian cup is usually 40 ml less than American standard system. i cooked bread halwa today. It got melted in our mouths really awesome. Please reduce the milk measurement, I tried with 5 pieces and Haif ltr milk, doesnt come out nicley. Hi Sailaija, I tried this recipe yesterday (Half the quantity) & it turned out yummy!! Dear Sailu, tried ur bread halwa, it was superb.. Everyone likes it.. Tq!! Today i made this halwa. Taste was awesome very yummy thanks for the mouthwatering recipe. How many slices of bead does a loaf contain? It differs according to size of bread.